Bonaire Windsurf Place is the only locally owned and operated windsurf station on the windward side of the island known as Sorobon, at Lac Bay. The water is shallow and warm, with steady tradewinds, and a beautiful beach–perfect conditions for catching some wind in your sails and claiming the freedom of the water in a sheltered and safe environment. 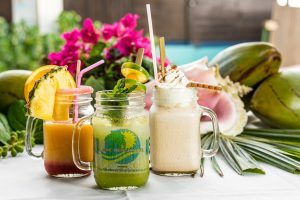 The owners of Bonaire Windsurf Place have great experience dating back to 1987. 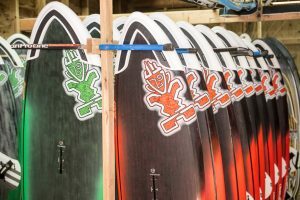 For those comfortable with their windsurfing abilities, Bonaire Windsurf Place offers the best in equipment rentals, with always the latest boards from Starboard and RRD and sails by Hot Sails Maui. 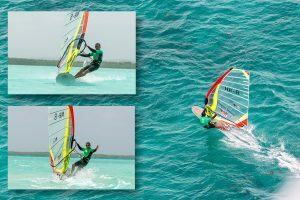 For those wanting to improve their skills, BWP offers instruction from people like Bonaire’s Windsurf Olympian & Champion, Patun Saragoza, but all the staff have held their own in regional competitions. The highly trained and friendly staff of BWP is always ready to give you the best and unmatched service, which our customers have come to expect over the years! Bonaire is an island in the Leeward Antilles in the Caribbean Sea. Together with Aruba and Curaçao, it forms the group known as the ABC islands, located less than a hundred miles off the north coast of South America near the western part of Venezuela. Unlike much of the Caribbean region, the ABCs lie outside the hurricane belt and have an arid climate. This helps tourism as visitors to the islands can reliably expect warm, sunny weather with steady trade winds. Bonaire is also a popular destination for scuba divers, and well known for easy access to its various reefs—its shores are known as one of the best windsurf spots in the world. 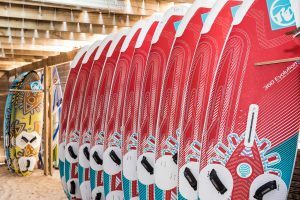 Recognized around the world as one of leaders in the windsurfing industry, RRD continues to produce the best production windsurfing boards available today. Lightweight, stiff, and durable. If you don’t own an RRD now, there is a good chance you’ll want to after a week with us. 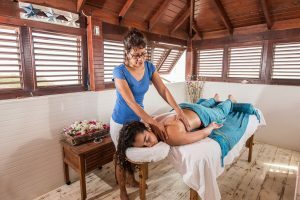 Pamper yourself with a massage or other spa treatment right on the beach! It doesn’t get any better than this. The Surf Shop at Bonaire Windsurf Place offers all the basics, such as surf shirts, sunscreen, t-shirts, and gloves, but also all the extra little touches–board shorts, rash guards, and a wide variety of specialty items, including sunscreen and surf shoes. Visit the Surf Shop for a gift for yourself or one of your favorite windsurfers! 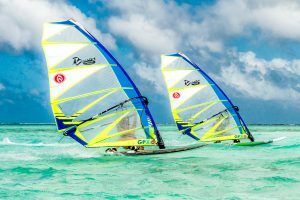 Bonaire Windsurf Place can offer you an entire windsurfing package, including accommodations, at our partner resort, SONRISA. Sonrisa is a small, boutique hotel just minutes away from Lac Bay, which offers casual elegance. It’s far more economical to book your entire package than to book vacation components separately, so do consider our vacation packages including accommodations and windsurf equipment rentals. BOOK NOW or Email for current rates.